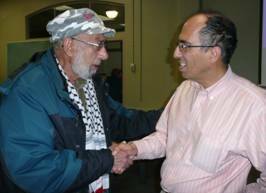 Photo: Dr. Qumsiyeh, on right, greets Younas Mirza, an active Palestine supporter. A self-described “troublemaker”, Qumsiyeh is Professor of Biology (Genetics) at the universities of Bethlehem and Birzeit and Director of the Cytogenetic Laboratory, Palestine Museum of Natural History. He is also a respected leader of popular resistance in Palestine – so respected he has been arrested and beaten many times by the Israeli occupiers of Palestine. Victorian activists were fortunate to hear and meet this activist and writer. (“Sharing the Land of Canaan: human rights and the Israeli/Palestinian Struggle”, and “Popular Resistance in Palestine: A history of Hope and Empowerment”. Qumsiyeh is a biologist and he began his presentation with a historical perspective, based on biological concepts of biodiversity. In Western Asia – a term he prefers to the euro-centred Middle East- of 15,000 years of continuous human civilization from the development of agriculture and the Aramaic alphabet, with Jericho at 12,000 years of age, the oldest city in the world, human society there has flourished with diversity. For 1% of that time, there was imposed monoculture, but every effort to perpetuate monolithic rule was a short-lived failure. As in biology, only diversity creates sustainability. Qumsiyeh said that academics should be part of society, be activists and believe in the power of resistance. 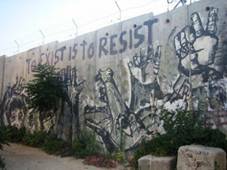 “To exist is to resist” as the art on the separation wall proclaims in a village in the West Bank. He is optimistic and hopeful that a community of resistance can overcome the present injustice. He told listeners that Palestinians have a history of resistance that spans many years, from the first demonstration with cars in 1929 to tax revolts to the present ongoing resistance to the apartheid wall. Daily life under occupation (giving birth to children, going to school, enjoying friends and family) are all part of resistance. The Palestine population is growing; there are six million within Palestine and approximately seven million outside Palestine. Internationally, resistance includes the growing BDS (boycott, divest, sanction) movement against Israel – in particular the cultural and academic boycott is isolating Israel even more from the world it claims to be part of. The history of Zionism has been a history of violence; Qumsiyeh said that founders of this ideology knew in the 19th century that the land they wanted was inhabited by its own citizens. Zionists knew that to create a European-style nation state, they would have to use violence to achieve their aims. It had to be “Fight or Flight.” Zionists did both; they developing military strategies and they drove out more than one million people in two Nakbas, in 1948 and 1967. They have destroyed more than 530 villages. Our famous contribution, Canada Park, is built on the ruins of three villages. It is planted with non-native conifers that are toxic to local plants. Up to this time Israel has destroyed more than 1.5 million tress in Palestine; including olive trees dated at 2,000 years old. The violence continues daily with destruction of homes and the theft of land. East Jerusalem, internationally recognized as a Palestinian city, is under constant attack. Bethlehem is being eaten up by Israeli colonies. Palestine is primarily an agricultural country. By destroying olive and other trees that create food and income, Israel is trying to destroy the economy of Palestine; but international organizations, like the Arab Group for the Protection of Nature, have planted almost two million trees, including many in Gaza where 1.5 million people live in an Israel-enforced “concentration camp.” In the West Bank Israel is relentlessly constructing its Apartheid Wall, which ,when completed, will be 760 kilometres long, enclosing 8.3% of the original lands of Palestine where 4.5 million in the West Bank live in an area less than ¼ the size of Vancouver Island. International condemnation of Israel’s war crimes is becoming more vocal; public awareness of the injustice of the occupation and the constant violation of human rights, in spite of media bias, is growing and understanding of the rights of Palestinians and the need for a democratic solution is increasing.